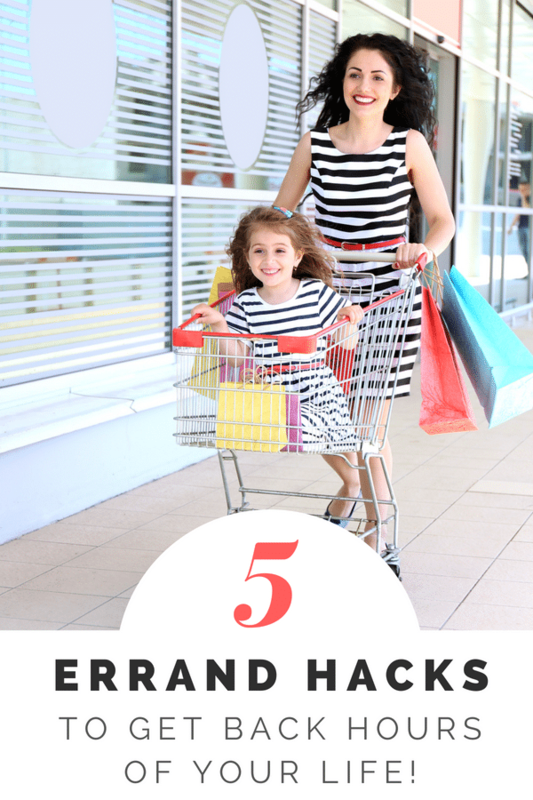 Preview: 5 tips to run errands and get things done without having to drag kids to the store! Errands. No one wants to do them but households need bread and milk. As if running around town isn’t bad enough, sometimes you have to take kids to the store with you. There are ways to run errands without taking kids to the store! A few easy tips to get things done without going crazy or having miserable kids singing “Running errands with my mom” (yes, it’s actually a song). If you have a list of errands to run, use these mom-hacks to get things done without taking your kids to the store. Exactly who looks like this when they are shopping with kids?! No one. Yet all of the pictures I found were happy families and smiling children. Maybe I am doing it wrong- but this is the opposite of how we normally look while shopping. Where are all the actual photos? The ones were the baby is screaming, the toddler is throwing a tantrum on the floor, and the 4-year-old begging me to buy everything she sees? Because that is real. Unfortunately, there were NO images of actual families fighting their kids through the grocery store just so there would be milk and bread in the house. 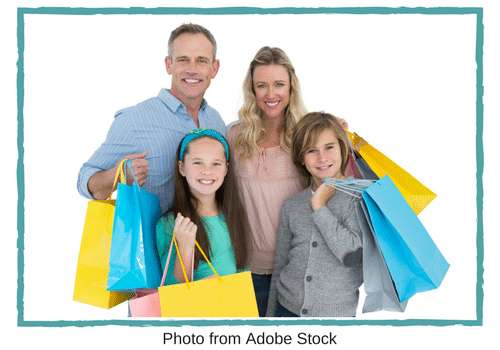 If your family looks like the above photo when you are shopping, PLEASE share your secrets! No one wants to go shopping with children in tow. It’s second only to labor itself. I am always looking for ways to avoid taking the kids with me to run errands. By the time I dress 3 kids, buckle them in car seats, drive 2 minutes to the store (it is that close), unbuckle them, grab their iPads and pray for in-store WiFi, fight them through the store, buckle them back up… you get it. It takes WAY longer for me to buckle/unbuckle than to run errands! Kids just don’t want to shop. As Llama Llama said so eloquently, “Yucky music, gret big feet. Ladies smelling way too sweet. Look at knees and stand in line. Llama Llama starts to whine”. As much as I try to involve them with their own shopping list, sing little songs, play I-spy, and let them have their iPads, it’s just not in their nature for kids to sit still and be quiet long enough to shop. It’s easier not to engage in the whole experience and find alternatives (a.k.a. sanity savers) to shopping with kids. I’d like to share with you some of the ways I found to get things done (groceries, prescription pick-up, etc.) without dragging my kids along. These things actually save me time and much sanity. (This post contains affiliate links. We are a participant in the Amazon Services LLC Associates Program, an affiliate advertising program designed to provide a means for us to earn fees by linking to Amazon.com and affiliated sites). ~You don’t have to go to the store. For almost anything. Ever. Enough said. I could talk all day about Amazon because Amazon is life. I’ll save you the lengthy explanation and instead direct you to: 5 things you didn’t know about saving money on Amazon. 2) GROCERIES– Although you can order your groceries on Amazon, sometimes even 2-day shipping is not fast enough. When you desperately need bread but don’t want to be “that family in Walmart”, try drive-thru grocery. Many grocery stores now offer an option to order your groceries online through their website, pay online, then select a time to pick-up your groceries. There is a designated pick-up area where you stop, park, and a store employee will bring your order to your car. There is a $30 minimum (but when is the last time you spent less than $30 at the grocery store. right?!). You can also check your local grocery chain’s website to see if they offer this awesome service. 3) BANKING– Going to the bank is painful. Every time I try to “run in” and make a deposit, there are 3 people in front of me who want to review every transaction posted to their account over the past 6 months. sigh. I’m sure you probably check your account and make some transfers online but there is even more that you can do. Many banks offer some type of “mobile deposit” where you can take a photo of your check and then deposit within 24 hours. Branch ATMs often take deposits too. Have a bill that doesn’t accept online payments? Try scheduling payments from your bank account. They make the payment for you from your account when you schedule it to happen. You can usually make it recurring so you only have to set it out once. Often you can also sign up for mobile alerts that let you know when a bill is due or your account hits a threshold. Bank offers and details vary so always speak to your banker or financial advisor first. Get lots more tips like this in the free Happy Mom Boot Camp email course! 4) STAMPS-: Buy stamps on the USPS site and have them shipped to you. Need to ship a package? You can fill out, purchase, and print a shipping label on the USPS site then schedule a time for your postal carrier to pick up the package. And you never had to leave the house. If you happen to ever make it to the grocery store, check the Customer Service Desk. Many stores sell stamps right there. This is a great option if you just need a book of stamps. 5) PRESCRIPTIONS– Instead of dragging your kids through the drug store, use the Pharmacy delivery service. Large chains such as CVS offer this service in many locations but I have found that many smaller, local pharmacies will also deliver. Call or check their websites to find out if this is an option and what the details are (minimum charge, delivery radius, etc). You can also use a mail delivery service such as Express Scripts if your insurance covers it. The mail services usually save you money (and a headache) so you might want to call the member services number on your health insurance card and look into it! If all else fails, I have heard there is a such thing as “errand services” that will run your errands for you. I’ve never tried one yet but if it means I don’t have to take my kids to the store- I might try it. It’s nice to know we’ve got options! 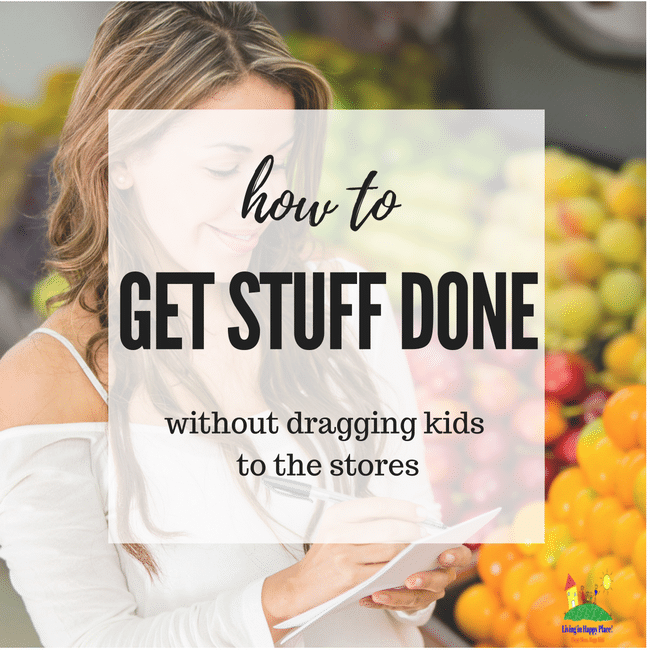 Hopefully, I have been able to give you a few ideas to “run errands without kids” that will save you a lot of stress! If you are looking for some more tips to organize, automate, and simplify your life so you can enjoy your kids, sign up for the free Happy Mom Boot Camp email course! 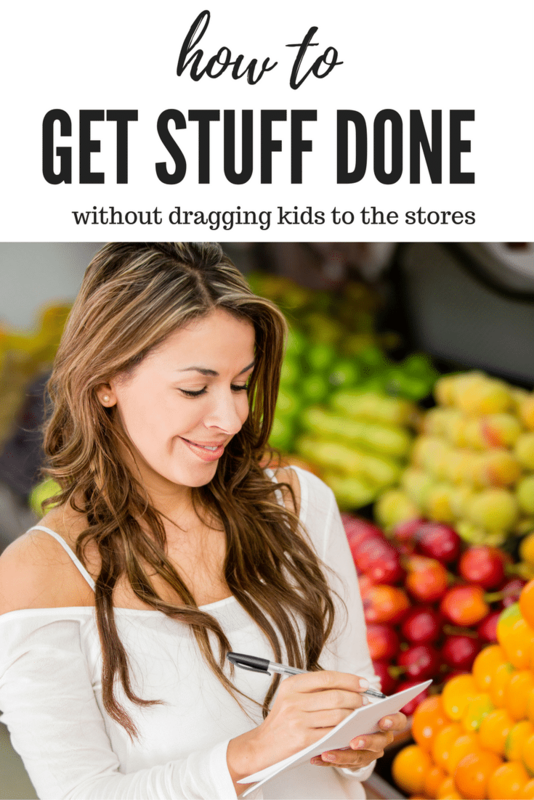 Pin this fow when you need to get things done but do not want to drag your kids to the store! 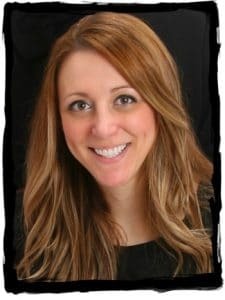 This article is an excerpt from Summer Survival for Moms. Because when the kids are home and you still have to run a household, you need a plan to keep your sanity. You can learn more here: Summer Survival for Moms! Skip the store and use these tips to efficiently run errands!